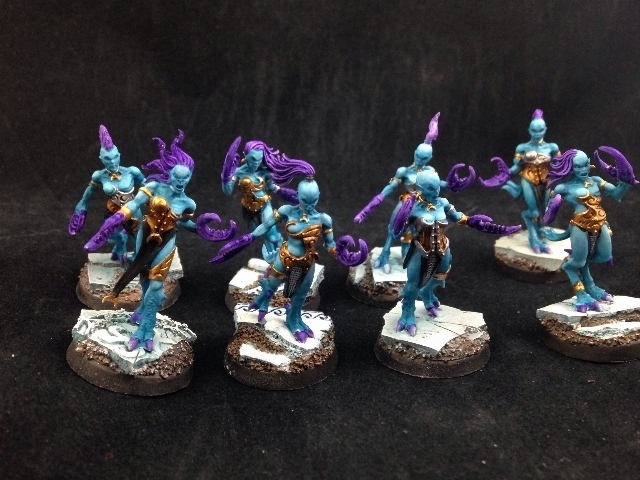 A discussion came up in the EC thread about Slaaneshi Daemon colour schemes. I was going to write a whole spiel on ideas but it began to slide into the subject of the Daemons of other gods in such a way I felt it deserved a dedicated thread. So anyway, this is a place to discuss different colour schemes for Daemons of all dedications, be they methods of painting the "normal" schemes, slight variations of the regular colours or even completely new schemes with very little relation to the studio colours. What ideas do you have? I have a ridiculous amount of ideas, so I'll try and get them out the way first. If I do any Khorne Daemons, I'm intending to do them in an unorthodox "winter" theme, with the skin colour being a bluish off-white. There would be some variation of course, with more common Daemons getting simpler paint processes, but overall they'd be fairly uniform. I'm currently painting Skulltaker in this sort of scheme, with a basecoat of Russ Grey (over white primer), a wash of Drakenhof Nightshade, and then working up to white. Bloodletters would probably be much simpler; most likely with Celestra Grey, a Drakenhof Nightshade wash and highlights of Ulthuan Grey and White Scar. Skulltaker's Slayer Sword has been done to look almost like supernaturally glowing ice crystal/glass, starting from black with blue to white highlights with a final coat of FW's clear Calth Blue. Again, Hellblades for Bloodletters would be much simpler, looking more like raw ice- I might do a "tidemark" effect over white with very thinned down washes and then 'ardcoat it. >Heavy, HEAVY washes of Druchii Violet, Nuln Oil and Athonian Camoshade in a fairly random pattern- inconsistency is actually desirable here as we're trying to get a blotchy, bruised look. >Light drybrush of Tyrant Skull. Obviously the other details will vary a fair bit (notably, my Beast's hair-tentacles are being painted bluish grey like a decaying large intestine) but most Nurgle models are mainly skin. The good thing about this scheme is that it's quite quick but also produces very good results, with a really nice varied look that avoids looking plain despite the fairly muted colours. All my Slaanesh units are going to be painted differently. This will make painting them more fun and also homages the early fluff where Daemon were described as being all sorts of crazy colours. The main consistency between the units will be the use of bright. vibrant colours as opposed to the muted greys and whites of the studio schemes. One Daemonette squad is going to be bright blue with orange hair and claws, another will be yellow with red hair and claws, etc etc. Also of note will be the chariots- each one will be painted and converted to look different from the other as if the Daemonettes crewing them were competing to have the most outlandish looking vehicle. One will be airbrushed with Molotow's Liquid Chrome for the framework, as if it were made of solid quicksilver (I may shade it with very selective applications of clear paints in recesses if it ends up looking too plain), another will be painted like crystal, another like ivory etc etc. Variety is the spice of life after all. The centrepiece would be a Lord of Change painted in magpie colours, predominantly white and black but with sheens of bluish-green. I wanted something a bit different, but also to have a sort of conflict in the daemonic having at first perhaps a more human appearance. It also works well expanded to other models, as I've used it on my Daemon Prince and Maulerfiend as well Might need to mix it up a bit when I get to my Steeds but I'll cross that bridge when I come to it. I always quite liked the idea of Khorne Daemons being white, but being perceived as red by humans just because they're absolutely drenched in gore, almost like a terror tactic. That means they'd potentially be different colours based on what race they are fighting against. Okay I'll repost my test Daemonette then. Was going for a more unnatural look with the "liquid" pitch black skin and pink-ish metal. I would love to see your nurgle models in those colours if you have them! I painted my Horticulous Averland yellow with a seraphim sepia wash over him and then some yellow highlights! It looks good, but I’d like to see or “bruised” effect! Nice topic, love the idea as we discussed in EC subject. Let me just finish my Daemonettes and i'll post them. I looked down the sights of my rifle, my target looked back. It's eyes were all the eyes I'd ever loved. They promised everything I could ever want. Love, comfort, safety. An end to this nightmare. I felt my will draining out of me, entranced by those eyes. Still WIP, the skin is pretty much done as are most of the cysts, but the tentacles, nails and offal are all early stages. Also note that aside from the method described earlier, there were other steps in certain areas, notably a light glaze of Bloodletter on some of the bottom parts. Can we see the face please? Skin looks pretty good ! The face is still very WIP, needs more work before there's really anything to see. But I'll be sure to photo him when he's ready. My finding was yellow-brown strongly drybrushed white gives a pus-like quality that I think is a great alternative to Nurgle's usual green. I am realy pleased with my pale Nurgle Daemons. Edited by DeStinyFiSh, 20 May 2018 - 07:21 AM. For my Slaanesh daemon i choose to go on an aquatic scheme. Because i do love the mix between turquoise (daemon) and deep purple (Emperor's children). And i find it appropriate for daemon with crabs claws, mount with sea horse head based on the mermaid myth of seducing humain in order to kill them.